This movie shows surface details beginning to resolve as NASA's Dawn spacecraft closes in on the giant asteroid Vesta. The framing camera aboard NASA's Dawn spacecraft obtained the images used for this animation on June 1, 2011, from a distance of about 300,000 miles (483,000 kilometers). 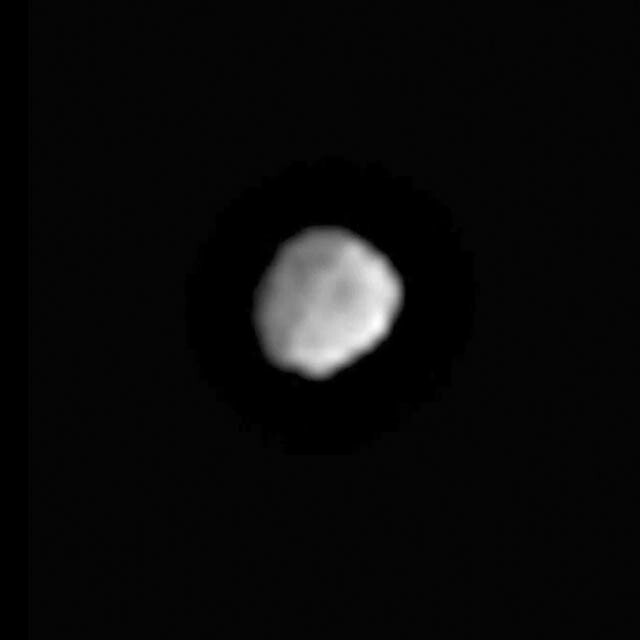 Vesta's jagged shape, sculpted by eons of cosmic impacts in the main asteroid belt, is apparent. Variations in surface brightness and hints of surface features can be seen. Vesta's south pole is to the lower right at about the 5 o'clock position. Vesta is 330 miles (530 kilometers) in diameter and the second most massive object in the asteroid belt. It is also the only large asteroid with a basaltic surface formed due to volcanic processes early in the solar system's history. Vesta is considered a protoplanet because it is a large body that almost formed into a planet. The video presents 20 frames, looped five times, that span a 30-minute period. During that time, Vesta rotates about 30 degrees. The images included here are used by navigators to fine-tune Dawn's trajectory during its approach to Vesta, with arrival expected on July 16, 2011. The framing cameras have been developed and built under the leadership of the Max Planck Institute for Solar System Research, Katlenburg-Lindau, Germany, with significant contributions by the German Aerospace Center (DLR) Institute of Planetary Research, Berlin, and in coordination with the Institute of Computer and Communication Network Engineering, Braunschweig. The framing camera project is funded by NASA, the Max Planck Society and DLR. JPL is a division of the California Institute of Technology, in Pasadena.